"Downtown Container Park" is a 50,000-square-foot outdoor shopping and entertainment venue in Las Vegas composed of repurposed shipping containers. Designed by Breslin Builders with modified shipping containers by The International Port Management Enterprise (IPME), the project took two years to complete. It boasts a vibrant array of shopping boutiques, a barbershop, various food and beverage providers, an observation tower and immersion dome, a children’s playground, and a stage for live performances. Other unique features include a three-story container elevator, forty-foot high climbing container, a concrete “living tree” topped with live plants, a tube slide that displays sensory experiences, and a 40 foot-long fire-breathing praying mantis sculpture, which greets visitors at the park’s entrance. 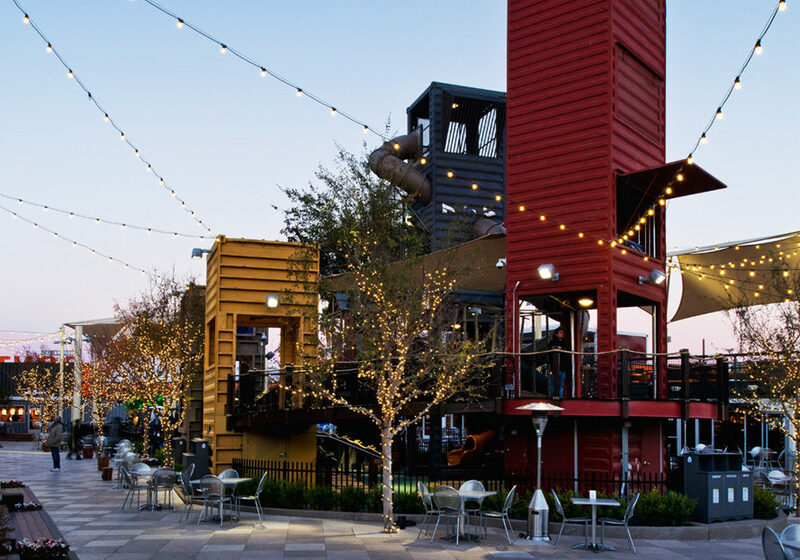 Orange county based cargotecture specialist, IPME, whose offices can be found within one of the park’s “cubes,” provided and repurposed many of the park’s shipping containers to create the modern but welcoming look that the venue is known for. The company provides the engineering, design, construction, project management, and permitting for both residential and commercial container building projects. Learn about their other transformative shipping container projects on their website. Downtown Container Park is an innovative solution for revitalizing a neglected area of the country’s entertainment capital. Home to just under forty thriving businesses, eye-catching cargotecture, and art, the downtown Container Park is earning acclaim as the first and only Las Vegas attraction of this kind. The project, which took two years to complete, boasts a vibrant array of shopping boutiques, a barbershop, various food and beverage providers, an observation tower and immersion dome, a children’s playground, and a stage for live performances. + Downtown Container Park is an innovative solution for revitalizing a neglected area of the country's entertainment capital. Other unique features include a three-story container-elevator, forty-foot high climbing container, a concrete “living tree” topped with live plants, tube slide that displays sensory experiences, and a 40 foot-long fire-breathing praying mantis sculpture, which greets visitors at the park’s entrance. Home to just under forty thriving businesses, eye-catching cargotecture, and art, the downtown Container Park is earning acclaim as the first and only Las Vegas attraction of this kind. Orange county based cargotecture specialist, IPME, whose offices can be found within one of the park’s “cubes,” provided and repurposed many of the park’s shipping containers to create the modern but welcoming look that the venue is known for. IPME's Container Park revives downtown Las Vegas with creative cargotecture. The IPME's Container Park entrance.